Collinsville teachers Debbie Kokotovich, Becky Juelfs and Vicki Fuhrhop were awarded $100 prizes as recognition for their efforts to promote internet safety during CUSD 10’s February 2019 Internet Safety Month. The educators were chosen by the CUSD 10 Technology Department for how they integrate internet safety concepts in their lessons. The $100 prizes were presented by Director of Technology Derek Turner. During Internet Safety Month, the entire district focused on what it means to use technology responsibly and safely. Students participated by making posters, coloring pages and reading information. At CHS, students’ Chromebook backgrounds were changed to feature different online safety messages. 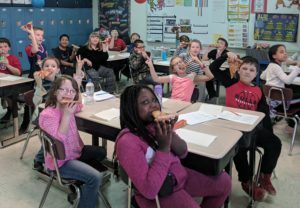 Classes with 100% participation earned a pizza party or Popsicles. Teachers who participated were asked to share their activities and ideas to earn a chance at $100 for their classrooms. One way that I integrate internet safety into my classroom is through research projects. Throughout the year, we research people, landmarks and animals. Also, students like to research topics on their own. There are many times we have to view several resources to get a variety of facts and information. We talk about and practice viewing sites that are safe and appropriate. We mainly view websites through safe search engines such as Kiddle, KidRex and Ducksters. However, there are times when we need to use things like Google. During these times, I stress to students to type “facts for kids” after whatever they are searching. Also, I may get on various sites before I even introduce a lesson to see what will pop up. Children today are always gaming online or watching videos on YouTube. We have discussions about getting their parents’ permission when viewing things at home or not giving out personal information to anyone online, even if they seem honest. In the area of emailing, there are times I monitor what students are sending to each other and whether or not they are using it as intended. If not, we talk about how to use it appropriately and respectfully. Our current unit of study revolved around the memoir “A Mighty Long Way” by Carlotta Walls LaNier, describing her story as one of the Little Rock Nine in Arkansas when schools were first integrated. Social media is a huge part of our students’ lives, but it was not even in existence for Carlotta. If she had this sort of technology, would it have helped her cause, uplifting and encouraging her? Or would it have brought only more bullying than she experienced? [Students were given] the journal topic: If social media had been present in Carlotta’s day, how might it have helped or hurt the Little Rock Nine as they attempted to integrate Central High? Students [were also] encouraged to make posters to demonstrate an example of social media in a positive and negative way as it might have been used in Little Rock in 1957. Several students had very thoughtful responses regarding the possibilities of extreme cyber-bullying. 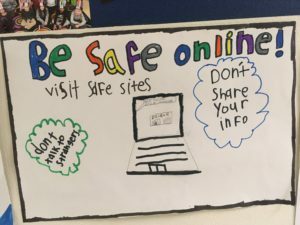 I’m always grateful for ways to “bring home” our current studies to make them relate to the students’ lives, and this month’s discussion about Internet Safety easily enhanced the students’ studies, helping them relate to the injustice of bullying – both in 1957 and in current events today. Making Personal Finance Decisions, Unit 10 Protecting, Lesson 10A: The Three D’s of Identity Theft. A brand new resource that I have been introduced to and have not had the opportunity to use is the Cisco Networking Academy free, online self-paced course for those who want to explore the world of cyber security. CUSD 10 has a special section on our website dedicated to Internet Safety. It has many age-appropriate resources and tips.